Oh the weather outside is frightful, at least throughout most of the US, where a cold front is keeping temperatures below freezing. What we all need is a good, warm knitted hat. This one features Kreinik's Reflective Yarn, making it visible at night when caught in car headlights or camera flash (oh the paparazzi!). The designer, Lisa Barnes, had a little fun with placement of the reflective accents. 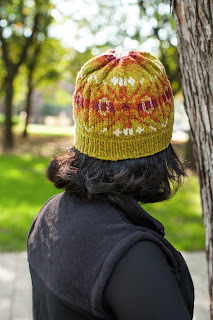 By day, this hat and matching wristers appear to be a harmless fair isle pattern. But by night, glowing eyes appear, as if by magic! Well, ok, it's the Reflective Yarn worked into the pattern, but how cool is that twist-on-the-usual. Have fun knitting these warm and cozy projects! Download the PDF with the materials list and pattern instructions. This hat is worked in the round from the brim to the crown, using double-pointed needles, two circular needles, or one long circular needle (for the “magic loop” method). The reflective “eyes” are created using duplicate stitch. Lisa founded LMB Designs to design knitwear for people and pets. Her creations have included felted purses, wire jewelry, and shrugs and wraps. Her pet designs have included a formal gown for a German Shepherd and a tuxedo for a Chihuahua. www.LMBDesigns.com. 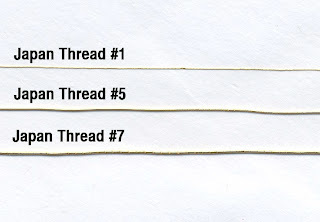 You may have the same question as this stitcher — what do Japan thread numbers mean? Does a larger number mean heavier thread? We answer these questions and more here, in 5 Things To Know About Kreinik Japan Threads. Smooth, bright, and shiny, they give the look of stitching with real metals. Japan #1 comes on spools. Japan #5 and #7 are available on spools or skeins. Kreinik Japan #1 is super fine, very thin, the thinnest. Kreinik Japan #5 is slightly thicker. Kreinik Japan #7 is thicker than #5. Japan #1 is a passing thread; stitch through fabric as you would a sewing thread. Japan #5 and #7 are gimps, or wrapped threads, and therefore couched onto the surface rather than sewn in and out of fabric. The metallic foil is wrapped around a core fiber, so if you stitch and and out with Japan #5 and #7, the wrapping may separate or come off. Japan #5 and #7 can be couched singly or multiple strands at a time for unique effects. Couch with a matching color of Japan #1, or a contrasting color of metallic or silk thread depending on the look you want to achieve. 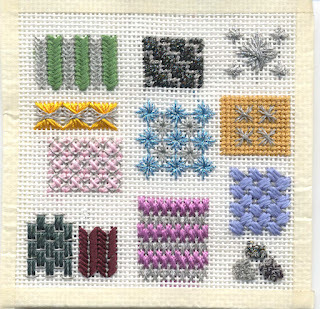 This gives stitchers/weavers/fiber-artists more Japan Thread textures (ie, creative options). A Japan Thread in Kreinik Tapestry #12 Braid, for instance, looks like a checked or serpentine metal thread. They are thicker, stiffer, and more texturized than the basic Japan Threads. Popular in needlepoint, counted thread, crazy quilting, temari, crochet, and surface embroidery techniques. Look for a "J" after the color number, as in 002J or 001J. The smaller the Braid number, the smaller the thread. 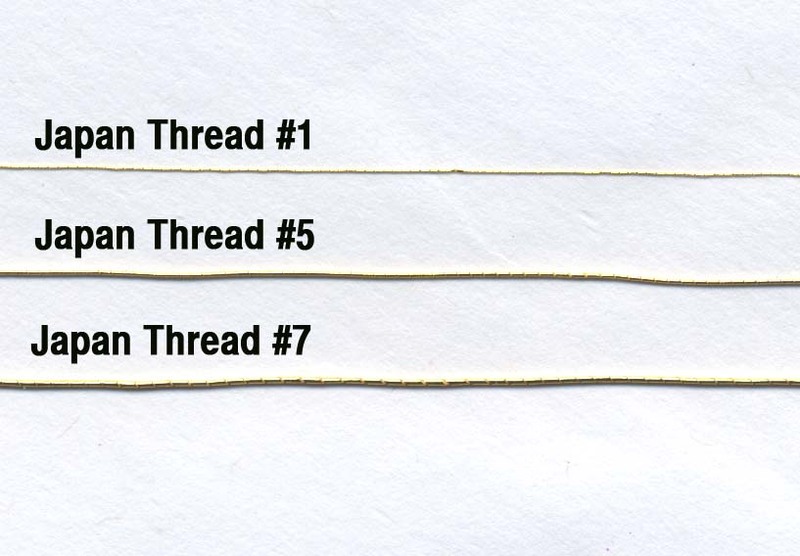 Kreinik Very Fine #4 Braid is the thinnest Braid, for example, and Fine #8 Braid is twice as thick as #4 Braid. 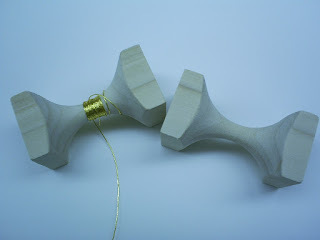 This generation of Japan Thread is synthetic and thus less expensive and more readily available than real metal threads. They have a percentage of real metal, but are non-tarnishing. You can dry clean needlework made with Kreinik Japan Threads. There's a new kid in town. Kreinik recently introduced Reflective Yarn to the knitting community and the buzz is spreading. It is the #2 top seller on www.kreinik.com, where it was used in three Christmas and winter-themed projects in December. The fiber will be featured in the Spring 2013 issue of Creative Knitting magazine (on sale February 2013); also see this link http://www.creativeknittingmagazine.com/printer.php?mode=article&article_id=2882. 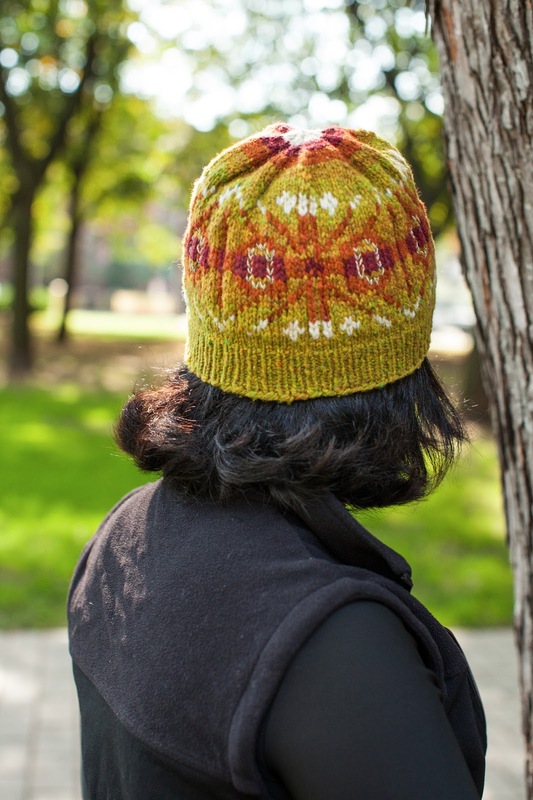 Designer Karen Ratto-Whooley is debuting a knitted hat pattern at the February 2013 TNNA Long Beach trade show (so look for it in stores shortly after). It has been tweeted, retweeted, blogged, Flickr'd, and Facebooked. Not a bad start for a little novelty yarn. Kreinik Reflective Yarn is a carry-along fiber with light-reflecting properties. It's part polyester and part glass beads (which gives it a sort of mesmerizing, holographic effect in addition to making it reflective). In knitting, it is meant to be a carry-along fiber. As a matte-gray color, it blends neutrally into other yarns. However, with a camera flash or car light, the project/design becomes luminously lit. Use it for adding reflective stripes or patterns to dog sweaters, purses, hats, scarves, wrist bands, headbands, and other garments. Being thread-centric here at Kreinik, we liked the fiber for the special effect properties, and the fact that it complements so many other threads and yarns. Needleworkers have been combining materials to create unique, custom looks for centuries, so this is just a new high-tech fiber for our generation. Where can you use a Reflective Yarn? This week we are playing with it in needlepoint. Based on early test stitching (stitches recommended by our fans on www.Facebook.com/Kreinik.Manufacturing.Company), we think there are many possibilities. 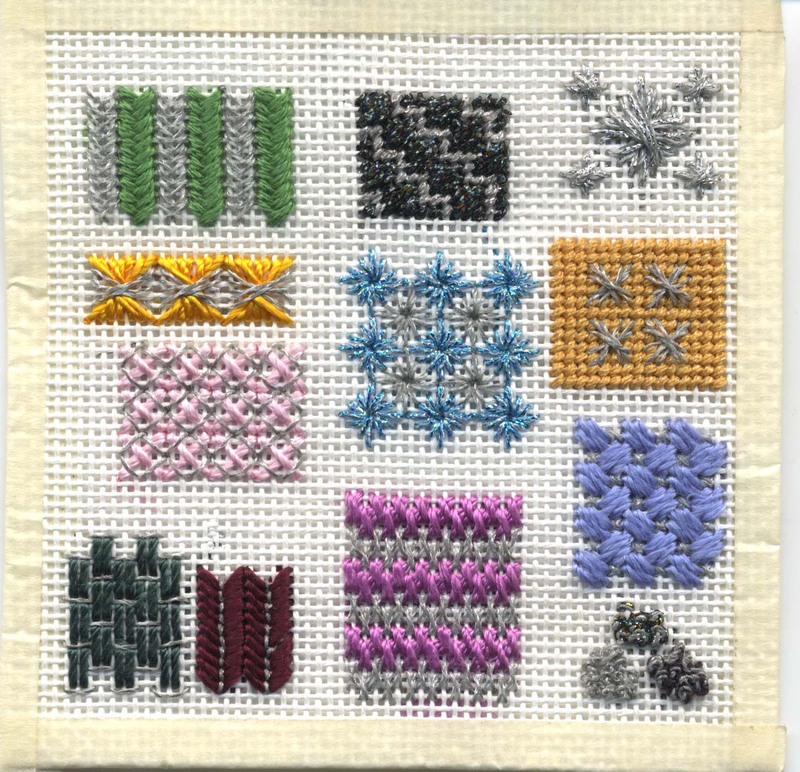 For example, we used it in the cross-stitch area of Criss-Cross Hungarian (using Silk Serica and Reflective Yarn). It offered a pretty, subtle look. It would be good for night sky backgrounds on needlepoint canvases. Then we combined it with one strand of black Silk Mori for French Knots. It looked pretty good. Using it alone in French Knots, there was a bit of fraying along the strand. Stick with using it as a carry-along and you shouldn't have a problem with abrasion from so many twists and turns of a French Knot section. It is not as strong as our Braids, so use it in stitches that don't require a lot of tension. Algerian eyelets and Smyrna crosses? Very cool! Use it as a carry-along fiber with Kreinik Very Fine #4 Braid on 18-mesh canvas, or with any of the larger Kreinik Braids on the bigger needlepoint canvases. It works beautifully in combination stitches - try the filament Silk Serica on the bottom with Reflective Yarn as top stitches. The luminosity of the Reflective Yarn goes perfectly with the natural luminescence of filament silk. See our swatch for our doodles. The Kreinik Reflective Yarn is about the size of our Very Fine #4 Braid, so use that as a guide in determining your coverage needs. Be careful carrying the thread in the back of your work - the backside of your stitches may illuminate through the open canvas. A 25-yard spool will go a long way, so it's perfect for wearable needlepoint projects and accessories. See the list of suggestions below to get started. Use it in designs that are going to see light reflection, like dog collars worn at night, and shoes. In needlepoint, specialty threads are all about adding color and "special effects" to make designs exciting and life-like. For example: glow-in-the-dark, holographic, fuzzy, metallic threads all add dimensional dynamics to designs. In the same way, this Reflective Yarn is perfect for creating realism and, well, a "special effect" in particular motifs. Here are some ideas for using it in particular design themes. We will keep stitching and playing, and hope you will enjoy this fun new novelty yarn in your own creations too. Email us or share photos on our Twitter or Facebook pages.